Apologies for thin wargame content lately. The added drama of abrupt changes on top of the usual pressure of a book release left me scrambling. 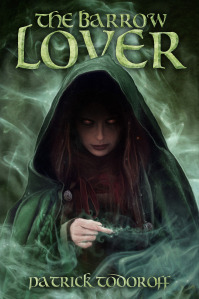 That said, here’s the Release notice for my latest novella The Barrow Lover. It is now available at Amazon. The Kindle version is up, the print one working it’s way through the release/listing process as I write this. Should be up in 3 or 4 days. A short, Celtic-flavored ghost story, The Barrow Lover is a quick read I’m actually quite proud of. If Horror, Supernatural thriller is your thing, please give it a read. 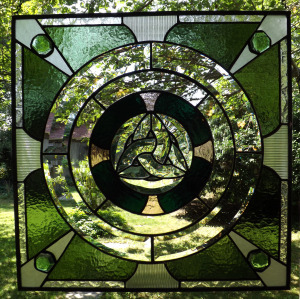 Also, the first 50 people who take the time to fire off a review at Amazon will be entered to win one of three Celtic stained glass panels. Here’s picture of the First Place prize. There’s a nice set of Pig Iron NF figs with heavy Armored suit and IFV vehicle drying on the table. Also some new terrain, along with a handful of GW Tempest Militarium dudes and Necron Deathmarks I brushed up for my grandsons. So we’ll be returning to our regularly-scheduled Wargame program shortly! PreviousCheeki Breeki at Woodpecker 4.